Making Room: Our Life in Sicily: "Bringing Up Bébé"
As I mentioned yesterday, I've loved reading Bringing Up Bébé this week. I've had my eye on the book ever since it was reviewed in the New York Times earlier this year. I don't know what made it so instantly appealing to me. Maybe because of the idea of a cross-cultural study in mothering? We live in Italy partly because we'd love to raise our kids overseas as much as possible. Or maybe because it's a study of mothering in another culture in general? Or maybe it was just because it promised to discuss the lives of obedient little gourmands. Set in France. Sounds like non-fictional chick lit. Is there a name for that genre? Anyway, finally it came to a library near me, and I read the whole book in two days. I honestly wish I owned a copy so that I could mark it up and remember all my thoughts and revelations as I read, but c'est la vie. This is my version of notes in the margins. 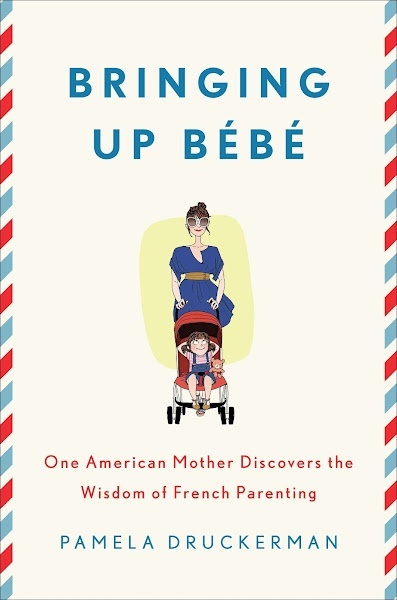 I should say that Bringing Up Bébé has received its fair share of criticism, partly because it's written by an American trying to summarize an entire subset of French culture, and because the author Pamela Druckerman focused only on her social niche in France (namely, middle class Parisians). However, as I know next to nothing about French culture and middle class Parisians, I chose instead to enjoy the book as a study of some parents that Druckerman knows who have gotten some things very admirably right. Although the book discusses much more than I will cover here, the main take-away topics for me were the attitude of French mothers towards themselves and their children, their infants' sleep habits, the French emphasis on waiting, their young children's varied palates, and the authority that forms the backbone of French parenting. This attitude continues into French mothers' parenting style. "What's different about French moms is that they get back their pre-baby identities, too. For starters, they seem more physically separate from their children. I've never seen a French mother climb a jungle gym, go down a slide with her child, or sit on a seesaw--all regular sights back in the United States and among Americans visiting France. For the most part... French parents park themselves on the perimeter of the playground or the sandbox and chat with one another." (p. 129) Later in that section Druckerman notes, "I'm also struck by the near-universal assumption that even good mothers aren't at the constant service of their children, and that there's no reason to feel bad about that." (p 130) That struck me as true. And freeing, both for me and my child. I tried out French parenting on the playground today with Lena. I didn't follow her up the stairs, I didn't coax her through the tunnels. I left her to her own devices, and, what do you know, she loved it! She also figured out the slide, which I'd been too frightened to let her slide down independently at all before. Thank you, French parenting. I remember the look on the face of a friend when I told her Lena still wakes up once a night. She couldn't imagine it, couldn't conceive it, and was panic-stricken just to imagine years of her life with young children where she wouldn't get to sleep through the night. Well, apparently the French also find this idea somewhat inconceivable, as they train their babies to sleep through the night by an average of about 3 months old. Druckerman learned that this is because French parents learn to pause whenever their baby cries out in sleep during the night. They might wait as long as 5 minutes, observing if the infant is just between sleep cycles or if the infant is truly awake and needing comfort. If the baby is wailing, the parents will pick up the baby and comfort him or her back to sleep. But over time this pause allows a baby to learn self-soothing techniques and the baby will increasingly learn to sleep through the changes in sleep cycles and eventually will learn to sleep through the night. According to Druckerman's observations, French adults of all ages will ask if your infant is "doing her nights" by around 3 months of age with the full expectation that the child will learn to sleep from about 8pm to 8am. Sign me up! I think I'll try this with our next baby! Have you heard of the marshmallow experiment? The children in the experiment that were able to wait to eat the marshmallow controlled themselves and their impulses through distraction techniques (little songs, playing with their toes, picking their ears, etc.). Down the road, those children that were able to wait demonstrated better reasoning and concentrating skills when revisited as teenagers. The author talked to the researcher behind the marshmallow experiment and compares the techniques the successful children used to the waiting habits instilled naturally in French children. Druckerman believes that French children are taught to wait on a regular basis. One big example of cultural waiting is the French children's meal schedule. They eat breakfast, lunch, a snack around 4:30pm (called gouter), and dinner, and that's it. They do not snack throughout the day. No baggies of Cheerios in their mother's purse whenever they're hungry. They learn to wait. The result, the author found, is a national culture with a lot less whining and a lot better table manners. I think any American reader will be dazzled by the delicious descriptions of French food in this book, most notably the food that is served at the author's daughter's day care center. "A typical menu," Druckerman describes, "starts with hearts of palm and tomato salad. That is followed by sliced turkey au basilic accompanied by rice in a Provencal cream sauce. The third course is a slice of St. Nectaire cheese with a slice of fresh baguette. Dessert is fresh kiwi." (p 112) This is the sort of food that French children grow up eating. In fact, Druckerman herself says she has learned over time to serve food in courses to her children, especially because serving vegetables first often ensures the veggies get eaten. A favorite takeaway for me: French parents traditionally bake with their children on weekends, beginning at a very young age. Can you think of a better activity that teaches patience and waiting (measuring ingredients, baking the cake, waiting until their afternoon gouter to eat a slice)? I copied down the recipe for the classic Gâteau au Yaourt (Yogurt Cake) that parents often make with their children. They reuse the empty yogurt container to measure all the other ingredients. Lena, let's start baking! Of course, all of this hinges on the parents. How do you teach your child to deal with frustration and learn to wait patiently? How do you teach your child to sit quietly at the table through four courses of food? It seems to be that French parents believe in an idea called cadre, or framework: "setting firm limits for children, but giving them tremendous freedom within those limits." (p xvi) Children are taught at an early age what those limits are, whether they be staying inside the sandbox at the playground, not throwing their food on the floor during dinner, or waiting to eat the candy at the birthday party until all their friends are also present. Within those limits, however, Druckerman describes a lot of freedom, such as children generally being permitted to eat as much candy as they so desire once the birthday party actually starts. Pushing or disobeying those limits, though, is absolutely non-negotiable (unlike with most American parents, often including myself). The way these limits are enforced is also through saying "non" ("no") and meaning it. This is so simple and so revolutionary. Druckerman describes a scene in which she was sitting with her French friend by a sandbox. Her friend's daughter was playing quietly. Druckerman's son ran out of the playground every two minutes. Her French friend instructed Druckerman that she needed to say "no" to her son and mean it. After about four tests and a great increasing in the conviction behind the "no," little Leo obeyed... and played happily and peacefully within his cadre in the sandbox. Druckerman had a calm and uninterrupted conversation with her friend. Elliott and I use "no" with Lena. He frequently reminds me that I need to speak with more conviction, to use the word once (not "no no no! "), and not to use her name as part of my command. He's right. A simple, convicted "no" leads to an amazing response from my daughter. I am inspired to speak with more authority. In fact, I might even learn to employ les gros yeux, but you'll have to read the book to figure out what those are! In this summary I've skipped so much of the book, including the lengthy discussions of excellent French daycare, the fact that French mothers rarely stay at home, and the early emphasis on childhood autonomy. There are parts of French parenting that are definitely not for me, and I don't want to pack up and move to Paris. (Well... at least not this very minute.) Also, it's obvious to me that Druckerman is focusing on a small subset of the population; she admits often how difficult it is to truly get to know French families in their homes, and so I know she doesn't have a pool of thousands of mothers from which she collected her data. So I take it all with a few grains of salt. But those grains of salt pack a lot of flavor, and I'm excited to sprinkle them on our parenting style and see what happens. What do you think? Does it sound like a worthwhile read? Overall, the book was fascinating to me, and I recommend it. I'd love to know your thoughts after you read it! I read the review on the Times and it didn't really inspire me to add it to my Goodreads list or purchase it. Your review, however, inspired me to add it to my Goodreads list, to check to see if it was available at my local library (so teeny and IT IS!) and sign up for a library card. I will be picking it up on my way home tonight. Thank you for writing such an intriguing review, of course I will add this to my summer reading list! I haven't really ever been around families with young children in France so I am very interested to learn about that side of French culture. Merci beaucoup mon amie!! And after some more perusing of the internet, I came across this very interesting Forbes article. The writer is coming from a totally opposite point of view but I think it's worth a glance over! And yes, I'd love to see a post about your library experiences. I have been all too impatient with libraries as an adult. Thanks for the Forbes article! The author both espouses things I love about America and things I am SO glad I am farther away from across the pond. So conflicted is my relationship with my own country. And how to strike a balance as a parent? I am sure I'll keep reading, thinking, praying... my whole life! I wanted to read this book when I first heard of it and am so thankful for your review... doesn't sound like my kind of parenting overall but I do agree with a lot of it. I like the food stuff and agree with the importance of meaning what you say when setting limits with your children. But I'm not so keen on the autonomy and the concepts that your life shouldn't need to change when you have a baby - that you can go back to life as usual. Creating another human is very good reason to have life change in my opinion and as far as I can see, those changes are for the better. Thanks for the review! "better than a water gun!"